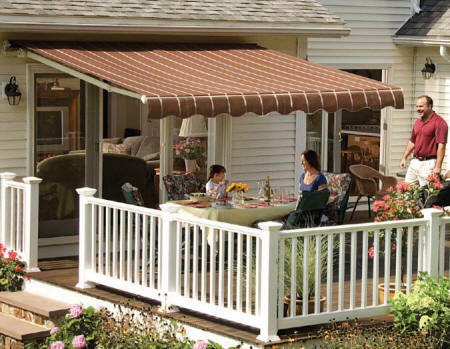 A SunSetter Awning lets you overcome the weather, save energy, and cut utility costs. 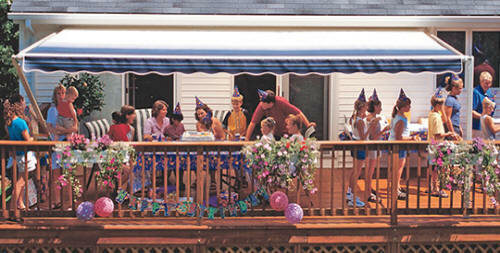 A Retractable Awning transforms your deck or patio into a beautiful semi-permanent "outdoor room". Awning Projections up to 10'2"
Awning Projections up to 11'8"
Weather Breaker rolls up and stores in the front bar. 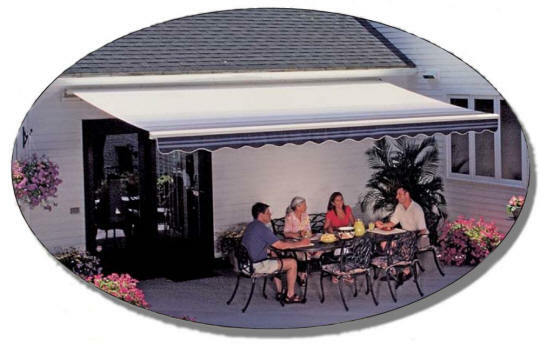 Available in both Motorized and Manually Operated Versions, in Two Sizes, 12 ft. x 10 ft. and 16 ft. x 10 ft.
Our unique freestanding retractable awning for lawns, decks, patios, poolside, or any location where you want beautiful cool shade and UV protection. 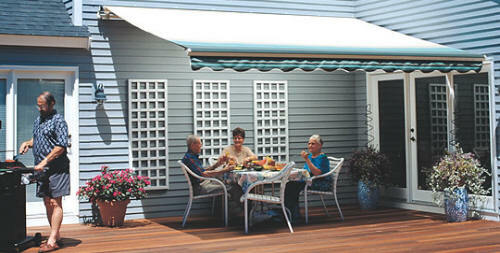 Can't install a regular SunSetter Awning on your deck or patio? We have a solution, SunSetter Oasis. 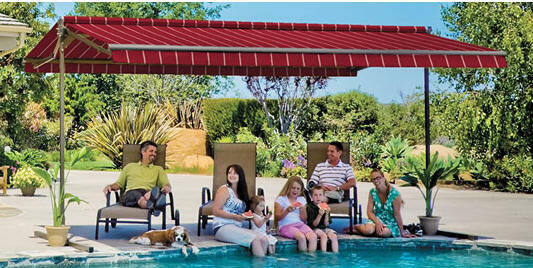 This standalone awning is stable on any level surface. Can be left outdoors all year long. Just retract it when not in use. 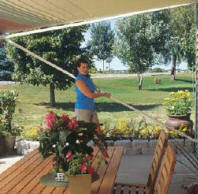 The benifits of a Lateral-Arm awning without the cost of motorization! Available widths: 8 ft. and 10 ft. to 18 ft., in one-foot increments. Projection: Up to 10 feet 2 inches from your house (the 10 and 11 foot awnings extend out 9 feet, and the 8 foot wide awning extends out 7 feet). Woven acrylic fabric in 16 decorator color choices. Minimum height under overhangs for installation: 7 ft. 6 in. Available widths: 7 to 20 ft, in one-foot increments. Projection: Extends out a full 10 ft. 2 in. Color choices: Twelve patterns and colors to fit every home. Minimum vertical height under overhangs required for installation: 7 ft.